The annual Thunder Over Michigan Airshow, presented by Ypsilanti’s Yankee Air Museum, returned vintage and modern aircraft to the skies over Southeast Michigan this past Labor Day Weekend. 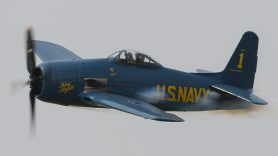 Thunder Over Michigan is known worldwide as a premier warbird show, and the organizers have had success in recent years attracting modern jet teams to expand their traditional flying program of vintage fighters, bombers, and transport aircraft. 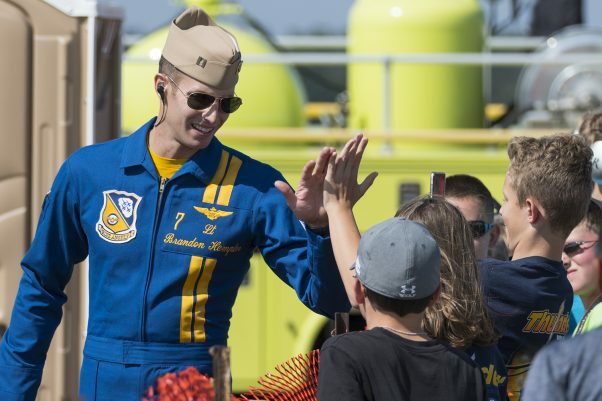 This year’s edition was no different, as the U.S. Navy’s Blue Angels were on the program with a supporting cast of aircraft dating back to prior to World War II. Thanks in part to the annual show and donations, the Yankee Air Museum was recently able to purchase a portion of the historic Willow Run Bomber Plant and is in the process of preparing it to become the permanent home of their collection. During WWII, the Ford-owned plant held an assembly line that initially produced components for airframes assembled by Douglas and Consolidated, and eventually transitioned to completely Ford-assembled airframes, building over half of the B-24 Liberators produced during the war. In addition to the blue and gold Blue Angels F/A-18s, this year’s theme aircraft was the C-47, also known as the Skytrain or Dakota. This militarized version of the famous Douglas DC-3 was instrumental in American and Allied operations during WWII continuing through the Vietnam War as the AC-47 “Spooky” gunship. Some variants remain in military service to this day with countries such as Colombia, El Salvador, and South Africa. In addition, civilian DC-3s remain popular as cargo haulers in many parts of the world. Seven of the venerable aircraft were on display at the show and they, along with a Curtiss C-46 Commando, were used as jump planes for a recreation of a WWII-era Allied aerial invasion performed by numerous historical round-canopy parachute military reenactors from the Liberty Parachute Team, Round Canopy Parachute Team, and the Airborne Heritage Platoon. 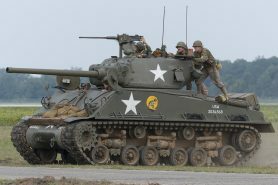 Each show day opened with the first portion of the traditional Thunder Over Michigan ground battle, with American and German WWII reenactors backed by mechanized infantry and heavy armor fought for control of the field in front of the crowd line. While the Germans had the upper hand in the morning portion of the reenactment, time would tell if they would be the ultimate victors. P-51C and D Mustangs (“By Request” and “Gentleman Jim”), B-25 Mitchells (“Yankee Warrior” and “Gerogie’s Gal”), and a rare early model P-40 Warhawk gave “air support” to the Allied ground troops. After the morning battle, there was a pause of over an hour before flying resumed, a result of the thin flying program at this year’s show. 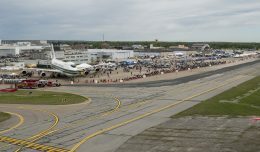 While it didn’t seem to deter Saturday’s record crowds, enthusiasts were left disappointed at one of the more expensive shows in the country having less than a full slate of acts, as had previously been hallmark of Willow Run shows. The Labor Day Weekend scheduling put Thunder Over Michigan at the same time as other regional shows in Toronto and Cleveland, as well as just two weeks after the airshow at nearby Selfridge ANGB which can certainly account for some of the difficulties in filling the flying program and static display ramp. The show was a victim of its own success, as well, with incredibly long lines for food vendors and restrooms, and difficulties with parking seen throughout the show weekend. The unmistakable sound of longtime airshow announcer Rob Reider’s voice boomed out over the PA system as flying resumed. In the absence of an Air Combat Command single ship demonstration team, the airshow team was able to put together heritage flight of their own, as an A-1 Skyraider led a P-51C and F-86 through the traditional three formation passes. Following the heritage flight all the aircraft made additional photo passes and the P-51 “By Request” flew an acrobatic demonstration. Greg Shelton took to the skies next as his wife Ashley climbed all over their Super Stearman. 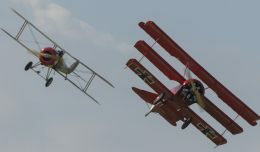 The couple worked their way through an aerobatic routine in the vintage biplane first with Ashley between the wings on the bracing wires, and then in the wingtop rack familiar to airshow fans. 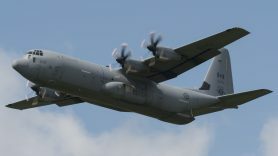 A Canadian Forces CC-130J from CFB Trenton performed a rare flying demonstration in the middle of the afternoon. While our “neighbours” to the north did not fly quite as aggressively as the Blue Angel’s C-130 Fat Albert, the crew did a great job of keeping the aircraft in front of the crowd and giving everyone a few unique angles to see the latest variant of Lockheed’s four-engined transport. Matt Younkin’s red and black Beech 18 flew next, and he wrestled the twin-radial-engined aircraft around the gusty Southeastern Michigan skies with a grace that’s only possible with thousands of flight hours of experience. Trailing two plumes of smoke, the 2017 Bill Barber Showmanship Award winner demonstrated just what an 80-year-old design can do when flown by practiced hands. Matt’s late father Bobby flew this same Beechcraft at airshows in the early 2000s. 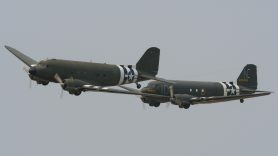 The rumble of round engines grew even louder as the C-46 and C-47s took off for their portion of the display. After a successful jump on Saturday, the historical parachute teams were unable to jump Sunday or Monday due to safety concerns. With winds over 30 knots on the surface and exceeding 60 knots at 3,000 feet, the weather exceeded limits for a safe parachuting display. Even without the jump, the cargo planes put on a show, first with a parade down the runway, then photo passes along the crowd line. A few of the C-47s joined up in a relatively tight formation for one of their last photo passes on Monday much to the delight of photographers on the ground. After the cargo planes, the ground battle restarted, signaled by the sight of Jack Roush’s P-51D “Gentleman Jim” and the sound of its Rolls-Royce Merlin engine swooping down over the battlefield in front of the crowd. Thanks to air support and a little help from a few Sherman tanks, the American reenactors were ultimately victorious in their conflict with the German forces. 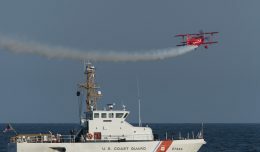 The final act before the Blue Angels was a great example of just how far aviation has come since WWII, as a Grumman F8F Bearcat took off and performed an aerobatic demonstration. 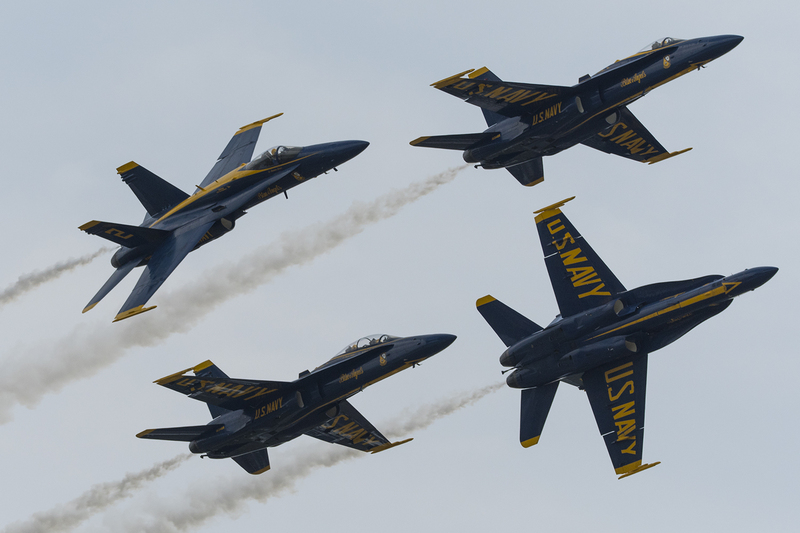 Wearing the livery of the original 1946 Blue Angels, the aircraft performed a few passes up close and personal with the crowd, providing a rare opportunity for airshow fans to see the past and present of the Navy’s demonstration team back to back. The Blues flew the Bearcat from 1946 until 1950, when the aircraft were pressed back into service during the Korean War in 1950. Before the airfield and airspace could be turned over to the Blue Angels, a University of Michigan Survival Flight EC155 helicopter landed at the south end of the spectator area to perform a medical evacuation. With Fat Albert and all USMC C-130s remaining grounded following the July crash of a Stewart ANGB-based Hercules, the Blues jumped right in with their signature precision walkout to the jets. After the ground team strutted their stuff, Boss Bernacchi and his team thrilled the crowd with the team’s signature formations, including the minimal wingtip to canopy separation of the Diamond 360 and the heart-stopping head-on passes from the Solos. A few maneuvers were modified or completely removed from this year’s demo, notably the Tuck Under Break. Conversations with the pilots revealed that this is due to a mandate from the team’s commanding Admiral in an effort to reduce G-forces on the aircraft and increase the availability rate and service life of the aging Hornets. This year’s Thunder Over Michigan was a successful show, but not without its problems. 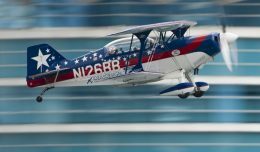 It remains to be seen if this was a down year for the show or if the shift to a less flying-intensive mentality is a long-term strategic choice. While record crowds certainly helped the bottom line, the lack of flying may serve to keep people away in future years, especially with cheaper or free shows being available in the region. With the obvious hurdle of competing with three large shows in the region on a single weekend, I think it’s certainly worth considering that Thunder Over Michigan will likely be back bigger and better than ever next year and really give the crowds something to smile about. Next year’s show will be held on August 25th and 26th and is set to be headlined by the US Air Force Thunderbirds. The author would like to thank the Yankee Air Museum volunteers and the Thunder Over Michigan public relations team for their hospitality and assistance in making this article possible.